District play is here and five teams remain unbeaten in Class 3A. Phillipsburg held leads of 20-6 and 27-12 before Beloit scored two touchdowns last in the first half to get back in it. Those two teams are joined in District 14 by Norton (4-2) and Minneapolis (3-3). Defending 3A champion Scott City and runners-up Silver Lake both sit at 5-1 and remain legitimate contenders to get back to Hutchinson. Rossville may be the new favorite to reach the state title game from the east after beating Silver Lake 27-21 last week. Meanwhile, Riverton and Southeast-Cherokee are each 3-3 with losses to the same opponents which have a combined 12 wins. Hiawatha (3-3) � The Redhawks� have lost three games by a combined eight points. Hiawatha led top-ranked Holton for much of the game before falling 12-10 back in Week 4. With several experienced players, including one of the state�s best in Peyton Newell, expect the Red Hawks to make a push for a playoff spot. Horton (3-3) � The Chargers are entering district play after a close loss to Maur Hill for the second consecutive season. Last year, Maur Hill beat Horton 21-20, while the Junior Ravens won 24-22 last week. Horton had started the season off 3-1, but have lost two straight. The Chargers have not reached the postseason since 2008. Sabetha (2-4) � The Blue Jays opened with three consecutive losses to 4A schools and sit at 2-4 entering district play.� However, Sabetha�s losses have come to teams that are a combined 19-5 this season. Quarterback Gaven Schumann has thrown for 864 yards and four touchdowns, while Kegan Schumann has rushed for more than 500 yards and five scores. Nemaha Valley (5-1) � Nemaha Valley is within just one point of being unbeaten.� The Raiders fell to Jefferson West 21-20 in Week 3, but also beat Hiawatha 14-13 two weeks later. Quarterback Caleb Meyer has thrown for 766 yards and seven touchdowns while rushing for more than 400 yards and six scores. Junior Devin Henry leads the Raiders with 458 yards rushing and eight scores. Henry is also second on the team in tackles with 54; one stop behind Brad Boeckman. Riley County (2-4) � After getting through a rough early season stretch that included losses to Centralia, Rossville, and Silver lake, the Falcons have won their last two games. Riley County picked up a solid win last week in a 44-40 shootout over St. Marys. Rock Creek (1-5) � Two years after reaching the substate semifinals, Rock Creek sits with just one win entering district play. The Mustangs five losses have come to opponents who are a combined 22-8 this season. Rock Creek picked up its first win of the season last week, 40-20 over Christ Prep. Marysville (0-6) � The Bulldogs have now lost 20 straight games dating back to the 2011 season. The Marysville offense has scored just 43 total points for an average of seven points per game. They have been shutout twice this season. Key Games: (Week 7) Nemaha Valley at Riley County may decide both playoff spots. Silver Lake (5-1) � Ranked No. 1 in Class 3A for the first five weeks of the season, the Eagles dropped to No. 4 after a 27-21 loss to rival Rossville this past week. The Eagles have been led by senior quarterback Dailin Kruger, who has passed for 752 yards, while rushing for 316. However, Kruger is playing with a knee injury he suffered a couple of weeks ago. Junior Ryan Matzke has played quarterback when Kruger has been unable. Jace Freeman and Isaac Pridey have been Silver Lake�s top receivers with 337 and 298 yards, respectively. Pleasant Ridge (4-2) � The Rams are playing power football, rushing for 332 yards per game. Quarterback Nick Holmes leads the way with 787 yards and 11 touchdowns on 100 carries. Kyle Grantham, Blake Graham and Jason Simonis have each rushed for more than 250 yards. Defensive lineman Logan McKinney has four sacks for Pleasant Ridge. Atchison County (2-4) � The Tigers enter district competition on a two-game losing streak after suffering big losses to Riverside and Centralia the past two weeks. Atchison County runs for about 200 yards per game, and the offense is led by dual-threat quarterback Kyle Chew. The senior passed for 144 yards and ran for 82 and a touchdown in a 21-8 victory over Valley Falls. Maur Hill (1-5) � The Junior Ravens snapped an eight-game losing streak with a 24-22 win over Horton on Friday. Senior Austin Geenens has led Maur Hill�s rushing attack with 504 yards and seven touchdowns on 73 carries. Mark McDermed has been the team�s top receiver with eight catches for 232 yards and four touchdowns. Brian Scott is a returning Kpreps all-state receiver, but has played transitioned to quarterback. Kicker Rafael Riquelme booted a school-record 54-yard field goal last week against Horton. Key Games:�(Week 9) Atchison County travels to face Pleasant Ridge in a game that could decide the district�s runner-up. Rossville (6-0) � Class 3A�s third-ranked Bulldogs are riding high after defeating rival Silver Lake for the first time since 2003 this past week. Under new coach Derick Hammes, Rossville has outscored its opponents 240-81. Sophomore quarterback Tucker Horak leads the offense with 943 yards passing and 758 rushing. The offense spreads the ball around to multiple receivers. Jack Steckel, Devin Morris, Corbin Horak, Thatcher Horak, Nick Reesor and Christian Roudner all have more than 100 yards receiving. Council Grove (5-1) � Braves senior quarterback Tanner Langvardt has produced more than 1,100 yards of total offense with 529 passing and 663 rushing. Lane Evans has rushed for 406 yards and nine touchdowns. At 5-1, Council Grove is enjoying one of its best seasons in recent years after earning only six wins over the 2011 and 2012 seasons combined. Mission Valley (3-3) � The Vikings enter districts on a two-game losing streak after losses to West Franklin and Osage City. Cody Smallwood leads a strong rushing attack as he�s ran for 805 yards and eight touchdowns on 94 carries. The Vikings are trying to make it to the playoffs for the first time since 2008. St. Marys (3-3) � The Bears are coming off a tough 44-40 loss to Riley County. They will try to regroup for district competition. St. Marys� other two losses were to ranked opponents in Class 3A�s Silver Lake and 2-1A�s Centralia. Philip Johnson has been key in the running game, rushing for 184 yards and two touchdowns in a 36-0 win over Wabaunsee. The Bears are a perennial playoff team but haven�t won a postseason game since 2010. Key Games:�� (Week 7) Council Grove travels to St. Marys for a game that will put the winner in the driver�s seat for a playoff spot; (Week 9) Rossville travels to St. Marys in a game that could decide the district title. Central Heights (4-2) � The Vikings are trying to reach the playoffs for an eighth consecutive season. Central Heights� four wins have come against opponents with a combined record of just 8-16, but the Vikings picked up a quality 28-7 win over Iola back in Week 5. Wellsville (4-2) � Wellsville won four straight games sandwiched between losses to 4A No. 3 Baldwin and Iola (4-2). Junior Brett Osbern leads the Eagles with more than 650 rushing yards, while senior quarterback Shamus Kearney has been effective in throwing the ball to provide balance. Senior Luke Meyer is the team�s leading tackler. Osage City (3-3) � Sophomore quarterback Ryan Haskins is looking to lead the Indians back to the playoffs after a one-year absence.� Haskins has passed for more than 730 yards and 11 touchdowns, while rushing for nearly 550 yards and four scores. J.T. Lincoln has 323 receiving yards and five scores on the season. West Franklin (3-3) � West Franklin has not qualified to the playoffs in the six seasons since Pomona and Williamsburg combined to form the Falcons. If this is to be the year, senior Josh Napper will have to lead them there.� Napper has rushed for 920 yards and scored 11 touchdowns this season. Eureka (4-2) � Eureka won its first four games before consecutive blowout losses to Caney Valley and Cherryvale. Another win this season for the Tornados will tie a single-season high during the past 10 seasons. Eureka last made the playoffs in 2010 finishing 5-5. Humboldt (4-2) � The Cubs also won four straight before dropping to Cherryvale and Caney Valley in the past two weeks. Humboldt has some solid weapons on offense in quarterback Alex Murrow, wideout Hunter Murrow, and back Jacob Carpenter. The Cubs have averaged nearly 30 points per game. Burlington (2-4) � Burlington�s two wins have come against winless squads in Anderson County and Neodesha.� Last week the Wildcats scored late after a long delay to top Neodesha 26-19. Fredonia (1-5) � The Yellow Jackets have not made the playoffs since 2006 and have just two wins in the past three seasons.� One of those includes a 30-27 win over winless Neodesha this season.� Fredonia fell 18-0 to Waverly, an eight-man team, last week. Key Games: (Week 7) Humboldt at Eureka to decide both playoff spots. Caney Valley (5-1) � The Bullpups have won four straight since a 21-6 loss on the road against a ranked Conway Springs team. Caney Valley has outscored its opponents 228-53 this season. Coach Criss Davis directs a Caney Valley squad that has advanced to the third round of the 3A playoffs in each of the past three seasons. Cherryvale (4-2) � The Chargers are on a four-game winning streaking after losing their first two games to Iola and Commerce, Okla. Senior running back Tristan Thornton rushed for 121 yards and one touchdown in a 41-20 win against Fredonia. They Chargers eye making the playoffs for the first time since 2009. Neodesha (0-6) � The Blue Streaks are 0-6, but they have played their last two opponents within a touchdown. Neodesha fell 30-27 to Fredonia and 26-19 to Burlington. The Streaks have made the playoffs in each of the past three years. Erie (0-6) � The Red Devils are on an 11-game losing streak. Erie has won only one game the past two seasons after posting a 6-5 record in 2011. Brett Thompson directs the Erie offense under center, while Chris Woolf leads the team with 1,035 rushing yards and five scores. Key Games:�(Week 7) Caney Valley will travel to face Cherryvale. Galena (5-1) � The Bulldogs� only loss this season was 32-26 to Class 4A�s undefeated Columbus Titans. Galena bounced back with a 27-15 win over Girard this past Friday. The Bulldogs boast a strong running game with junior Gabe Helton rushing for 822 yards and 11 touchdowns on 90 carries. Kyler Cook has completed 40 of 65 yards for 837 yards and six touchdowns. St. Mary�s Colgan (5-1) � The Panthers are coming off a 26-10 loss to Columbus after leading 10-0 at halftime. Colgan has outscored its opponents 196-48. Luke Marquardt directs the offense under center, and Drew Dawson leads the Panthers with more than 400 yards rushing. In their second year at the 3A level, the Panthers aim to get back to the playoffs after advancing to third round in 2012. 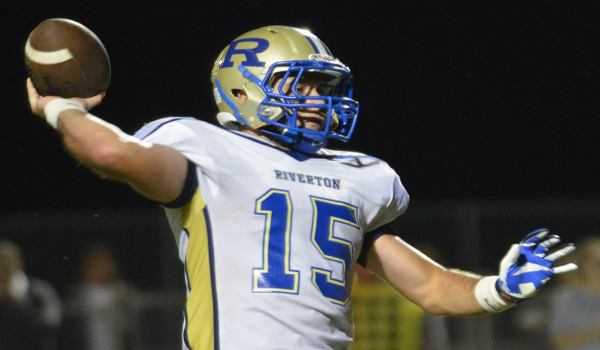 Riverton (3-3) � The Rams have won three of their last four games after opening the season 0-2. Riverton boasts a strong passing game with quarterback Chandler Underhill and wide receiver Landon North. Underhill has completed only 43 percent of his passes, but he�s thrown for 968 yards and 10 touchdowns. North has 30 receptions for 671 yards and seven touchdowns. Southeast-Cherokee (3-3) � First-year coach Jacob Lott had led an improved Lancers squad after being outscored 82-12 in the first two games. Southeast has won three of its past four games, averaging 42.5 points over that span. Ryan Rakestraw leads the Lancers� ground attack with 953 rushing yards and 13 touchdowns on only 80 carries. Key Games: (Week 7) � Galena travels to face St. Mary�s-Colgan in a game between the two district favorites. Conway Springs (6-0) � The Cardinals have outscored opponents 243-40 and rank No. 2 in the classification in scoring defense, just three points behind top-ranked Phillipsburg. Conway Springs has been tested twice with a 21-6 Week 2 victory against Caney Valley and a 34-14 win against previously undefeated Wichita Trinity Academy two weeks ago when all-state running back Tyler Burns suffered an injury on his first carry. The Cardinals haven�t allowed more than 14 points in any contest. Conway Springs rarely passes in its single-wing, but Dakota Finstad threw for 132 yards last week against Garden Plain. Against Trinity, Travis Wood was banged up early but returned to finish with 27 carries for 199 yards and Finstad had 17 carries for 184 yards. Conway Springs has made the playoffs every year but two since 1996. Chaparral (3-3) � Chaparral has lost to Wichita Trinity, Garden Plain and Cheney by at least 14 points. Chaparral, under veteran coach Justin Burke, has made the playoffs two times in the last three years. Scoring defense was a concern last year after the Roadrunners allowed more than 42 points five times. This season, the program has allowed 30 points per contest. Douglass (3-3) � Douglass has had trouble against strong teams with a 28-14 Week 1 loss to Garden Plain and a 30-6 loss to Trinity Academy last week. The Bulldogs also lost 40-28 to Christ Prep, a non-KSHSAA school, in Week 2. Douglass has made the playoffs three times in the last five years, but has lost in the first round each time. Belle Plaine (0-6) � Belle Plaine has lost every contest by at least 26 points. Its closest game and highest scoring contest was a 54-28 loss to Haven last week. Opponents have outscored Belle Plaine 295-66. The Dragons have not made the postseason since 1996. Key Games: (Week 7) Chaparral at Douglass will decide the runner-up spot. The two teams are virtually identical and have split the last six meetings. Douglass gets a slight edge for playing at home. Sedgwick (5-1) � Sedgwick has tallied 272 points and ranks No. 2 in Class 3A in scoring offense behind Beloit. The Cardinals have allowed 148 points per game and played in some high-scoring contests, including a 57-35 win against Olpe and a 62-48 loss to Sacred Heart. Sedgwick, 3-0 at home, has averaged 498 yards of total offense per game, with 266 through the air and 232 on the ground. Junior Brylie Ware has completed 100 of 160 passes for 1,559 yards with an 11/3 TD/INT ratio. Senior Dalton Brandt has rushed 105 times for 834 yards and 17 scores. Wichita Independent (2-4) � Independent had a six-win improvement last year and reached the postseason for the first time in school annals. Senior Jordan Reed has completed 22 of 41 passes for 323 yards with a 5/1 TD/INT ratio and leads the team with 40 carries for 319 yards and five scores. Defensively, Independent has permitted at least 33 points in all but one contest. Leon-Bluestem (1-5) � Bluestem has struggled for many seasons and opponents have outscored the Lions 204-83. The lone victory was a 41-12 victory against Belle Plaine three weeks ago. Whitewater Remington (0-6) � Remington has lost every contest by at least 26 points. The Broncos are 1-14 in the last two seasons and have lost eight in a row. Key Games: (Week 9) Wichita Independent at Leon-Bluestem for the runner-up spot. Kingman (3-2) � Kingman had a rare Week 1 bye when Sunrise Christian Academy cancelled and then lost 27-20 to Smoky Valley in Week 2. After back-to-back victories, Kingman lost 41-27 to undefeated Hesston and then defeated Halstead, 28-21, last week. Kingman has averaged 275 rushing yards a contest and has five players who have rushed between 193 and 442 yards and scored at least two rushing TDs. Garden Plain (3-3) � Garden Plain has already tied for the most losses in a season in the last decade. The Owls have seven double-digit win years since 2003 and have made the postseason every year since 1998. Garden Plain has outscored opponents 151-141, but has lost three straight with a 47-26 defeat to Trinity, a 27-18 loss to Cheney and a 27-8 loss to Conway Springs last week. Garden Plain has played the classification�s sixth-hardest schedule, according to preppowerindex.com. Haven (2-4) � Haven fell 28-19 to Eureka and lost 13-10 to Pratt in the first two weeks. The Wildcats fell 55-33 to Hesston in Week 3, and 39-6 to Smoky Valley in Week 4 before back-to-back victories. Haven reached the playoffs for the first time since 2003 and the fifth time in school history last season. Hutchinson Trinity (2-4) � Four of the Celtics six games have 29 or fewer combined points. The other contests are a 64-14 victory against Remington in Week 4 and a 42-7 loss to Sedgwick in Week 5. Trinity has had three players at quarterback and completed 38 of 85 passes for 428 yards with a 2/11 TD/INT ratio. Key Games:�All contests will be key in a competitive district. Marion (5-1) � Marion has significantly improved its defense after it allowed more than 39 points six times last year. The Warriors rank No. 7 in Class 3A in scoring defense and have already exceeded last season�s win total from a 4-6 year. Marion has a strong opportunity to win its most games since a 7-2 season in 2005. Halstead (3-3) � Halstead has played close games nearly every contest en route to a L-W-L-W-W-L slate. All of Halstead�s games are within 20 points, including two within seven points or fewer. Halstead hadn�t made the playoffs since 2008 and has three straight winning seasons. The Dragons have played the classification�s No. 5-strength of schedule, according to preppowerindex.com. Hillsboro (3-3) � Hillsboro, in its spread offense under second year coach Lance Swayer, has averaged 28.5 points per contest, but allowed 34.2 points per game. Last season, the Trojans went 10-1 and averaged 36.1 points per contest, but allowed 11.7 points per game. Hillsboro lost back-to-back games to undefeated Central Kansas League foes, but then bounced back with a 43-17 victory versus winless Whitewater-Remington last week. Moundridge (2-4) � Moundridge has also eclipsed last year�s win total from a 1-8 season and looks to post its tenth playoff berth in the last 11 seasons. The Wildcats have outscored opponents 131-127. Moundridge has played the classification�s No. 2-easiest schedule. The Wildcats opened the season 0-3 before two wins and a 49-24 loss to Sedgwick last week. Sacred Heart (5-1) � Sacred Heart has tallied 44 or more points in the last five weeks, including a 56-44 loss to Class 3A No. 1 Beloit in Week 4. Overall, Sacred Heart averages 49 points and 416 total yards per game. Trevor Webb has rushed 52 times for 527 yards and four scores and Nick Wuthnow has completed 39 of 64 passes for 677 yards and an 11/2 TD/INT ratio. Southeast of Saline (5-1) � Southeast of Saline had a perfect first five weeks, but lost 42-0 to Beloit last Friday. Beloit outgained the Trojans 460-219, including 435 rushing yards. For the season, Southeast of Saline has outscored opponents 41-13. Cody Schlesener has completed 44 of 75 passes for 752 yards with a 10/2 TD/INT ratio. Southeast of Saline has played Class 3A�s third-easiest schedule. Lyons (4-2) � Lyons has outscored opponents 198-173, but has played multiple close games. The Lions� first three contests were a 14-point win, an 18-point loss and a 12-point win. Lyons has doubled last year�s win total and has significantly improved an offense that never scored more than 20 points last fall under first-year coach James Johnston, the former longtime South Barber coach. Lyons last made the playoffs in 2009. Ellsworth (3-3) � Ellsworth started the season with a 37-25 loss to Larned and then followed it up with three straight victories, two by 13 and four points. After a 72-21 loss to Beloit, the Bearcats lost 22-20 to Minneapolis last week. Ellsworth actually outgained Minneapolis 248-234, but committed four turnovers, including three interceptions, one that was returned 41 yards for a TD. Beloit (6-0) � Beloit headlines what is the classification�s strongest district. The Trojans used a comeback victory against Phillipsburg in Week 7 last year and Norton pulled off a road upset at the rival Panthers in Week 9 to qualify for the playoffs. Beloit, ranked No. 1 in Class 3A, again leads the classification in scoring offense with 322 points. The Trojans average 407 rushing yards a contest. Bowe Behymer has rushed 82 times for 1,008 yards with 16 scores, while Payton Vetter has rushed for 509 yards, passed for 396 yards and accounted for 13 scores. Phillipsburg (6-0) � The Panthers started 6-0 last season en route to a 7-2 finish and a disappointing non-playoff year. This season, senior quarterback Riley Juenemann has completed 32 of 54 passes for 690 yards with a 6/3 TD/INT ratio. Five players have rushed between 431 and 113 yards and combined for 22 rushing scores. The Panthers have the No. 1 scoring defense at just 37 points allowed. Senior Andrew Makings leads the team with seven sacks. Norton (4-2) � Norton started poorly with big losses to Smith Center and Goodland, but has since righted the season with four straight victories. Sophomore Jordan Dole and junior Kendall Miller have continued to split time under center, but the two have passed for just 217 yards. Instead, it has been the rushing attack that has averaged 215 yards a game. Senior Tanner Furbush has 75 carries for 376 yards and five scores. Minneapolis (3-3) - Minneapolis started 2-0 before it lost three straight games by at least 40 points before a 22-20 victory versus Ellsworth last week. Minneapolis has averaged 265 yards per game, including 180 on the ground. Scott City (5-1) � Scott City saw its first regular season loss since Week 8 of the 2008 season with a 25-6 defeat to Ulysses after a 3-0 start. Since then, the Beavers, the defending Class 3A state champion, have bounced back with victories of 28-0 and 28-14. Scott City has mixed passing and rushing effectively. The Beavers passed for 167 yards and have rushed for 158 yards. Junior Trey O�Neil, coach Glenn O�Neil�s son, has completed 47 of 88 passes for 759 yards with a 7/4 TD/INT. Hoisington (2-3) � The Cardinals have a young team and started the season with a pair of losses. After a 55-6 victory versus Ellinwood, the Cardinals lost 33-6 to Phillisburg, Hoisington defeated previously undefeated Larned, 27-9, last week. The Cardinals trailed 9-7 after the first quarter, but then scored 20 points. Russell (1-5) � Russell�s only victory for first-year coach Chuck Bisbee came against winless Republic County. Four of the losses have come by 34 or more points. Thomas More Prep (1-5) � TMP, which hasn�t made the playoffs since 2002, has lost five in a row. The Monarchs have played better than past seasons including close losses to Clay Center and Ellsworth and held leads against state powers La Crosse and Phillipsburg. However, TMP has had trouble maintaining those leads and eventually suffered big loss to Larned, La Crosse and Phillipsburg. Key Games:�(Week 7) Scott City at Hoisington should decide both spots. Cimarron (3-3) � Cimarron has played the No. 53 strength of schedule and outscored opponents 214-154. Senior quarterback Caleb Fischer has thrown well, including seven touchdowns and one interception in his first two contests. Holcomb (3-3) � Holcomb has mixed the run and the pass effectively with 123 passing yards and 119 rushing yards. Senior Heath Tucker is one of Class 3A�s all-around top players. He has completed 41 of 77 passes for 643 yards with a 5/7 TD/INT, 86 carries for 424 yards and seven scores. Tucker also has 228 all-purpose yards. Holcomb has played the No. 1 strength of schedule in Class 3A and has outscored opponents 125-116. Lakin (3-3) � The Broncs have played the No. 59 SOS, but has delivered 187 points, 57 more than their opponents. Lakin is 0-3 at home and 3-0 on the road. The Broncos, a consistent playoff team under coach Jeff Fuss, lost twice in the district last season, but fell by three to Cimarron and 17 to Holcomb. Southwestern Heights (3-3) � Southwestern Heights has won three games, but opponents have outscored them 149-92. Sophomore Efrain Chavez has delivered a strong season with 148 carries for 553 yards and five scores. No one else has carried the ball more than 26 times. Key Games: All four games will be key in an unusual district where all four teams have the same record.� However, Holcomb�s strength of schedule and Lakin�s overall strength is the difference for the duo.